I can't have two accounts with the same username/password in different domains? Icewarp Mail Server needs 2 databases by default - the database for the Groupware module and the database for the Anti-Spam engine. The groupware database stores all groupware items - calendars, address books, notes, journals, etc. The anti-spam database contains the quarantine items and the intrusion prevention records. The accounts and domains settings are by default stored in the binary files in Icewarp\config folder, but you can configure Icewarp to store that in a database also. You can store also logs in a database, but it's not recommended. You can find the groupware database connection settings in the Main Menu > Groupware > General > DB Settings box�. 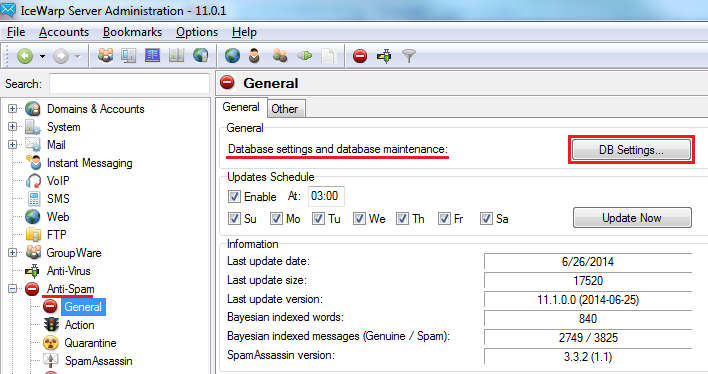 The anti-spam database connection settings can be found in the Main Menu > Anti-Spam > General > DB Settings box. And the account database settings can be set in the Main Menu > System > Storage > Accounts tab > DB Settings box� (after you enable database account storage). The Icewarp 10.x.x/11.x.x (Windows) installer lets you choose whether you plan to use Icewarp as small or large server - the basic installation for < 500 accounts and advanced installation for 500+ accounts. This question is asked because of database storage. There are basically 2 types of databases - file databases and database servers. The file databases are suitable only for smaller servers - they don't need any additional programs to be installed, but they don't handle big loads well. The database servers need to be installed and configured, however they are able to handle the more traffic. The account database storage is recommended for Icewarp with more than 500 accounts, the dedicated SQL server is recommended for Icewarp with more than few thousand accounts. Generally Icewarp supports syntax of these database servers and database engines: MS SQL, MySQL, InterBase, Oracle andFirebird, MS Access and SQLite. The syntax is important because of difference between the string variable type of each SQL server. The "Default" syntax is universal syntax, but it doesn't use full potencial of the specific servers, so it's better to specify the correct server syntax. ODBC (Open DataBase Connectivity) - the ODBC DSN (Database Source Name) is needed to connect to MS Access database, MS SQL, InterBase and Oracle servers. The MySQL and FireBird database can use either it's own drivers or ODBC. SQLite - the SQLite database doesn't need the ODBC DSN or any additional driver installation. The database files are installed with Icewarp 10.x.x/11.x.x regardless the currently selected database settings (the along with SQLite driver). You should either add this path to Windows system path or copy this file to Windows\system32\ to be able to connect to MySQL server without ODBC. MySQL database is needed for Linux installation of Icewarp 9.1 or older (in case you want to use Groupware and Anti-Spam features mentioned above). Required libraries are in most cases installed along with Linux. Icewarp contains integrated database migration tool. You can use it to migrate from one type of database to another (to the same type too, of course), as well as to backup your database. 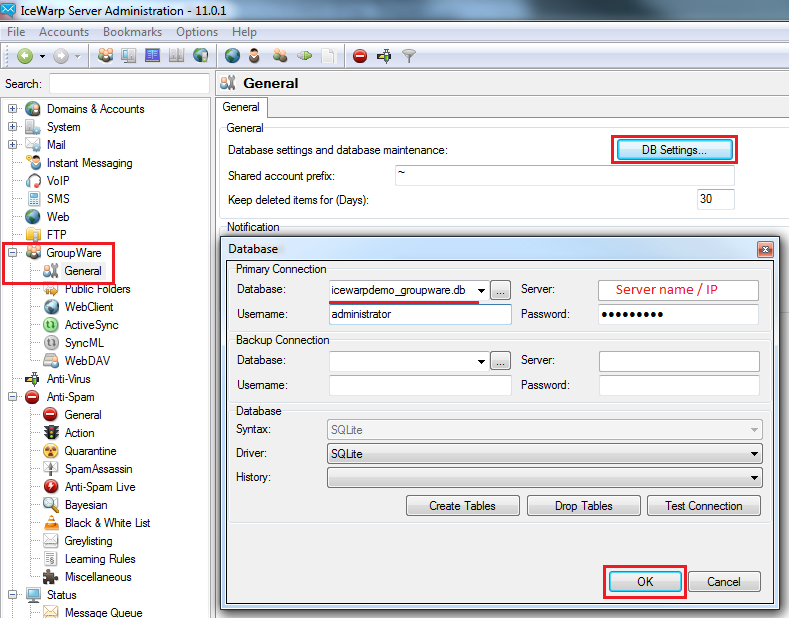 The database migration is located in the Administration interface System/Tools/Database Migration section. 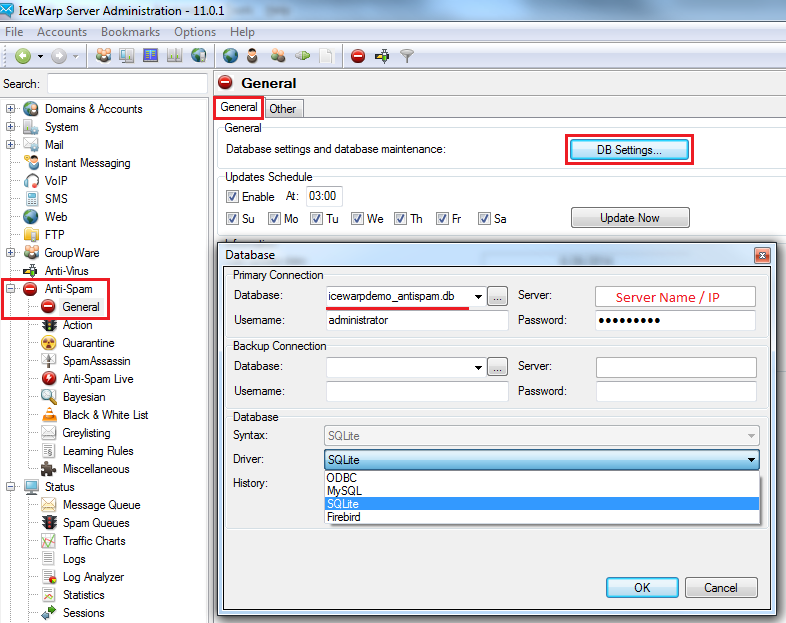 You should select the database type (whether you migrate account, groupware or anti-spam database) and fill the DB connection settings according to instructions in previous chapter. Database migration process drops destination database tables (not all, only those, which belong to selected database type, and only if the tables exist, naturally), and creates new tables with the same data as in the source database. All database errors are recorded into Icewarp error log (you can find it in the Administration interface Status/Log/Error log). So if you experience any problems with the database check the log first. As mentioned above, the file based databases are not suitable for larger servers (100+ accounts), so these servers should migrate database the some SQL servers this may resolve many problems.